Piramide porcelain stoneware coffee table with thin charcoal metal legs. The top is available in marble effect, matt or polished, white, black, orobico, iron. Piramide sofa side table, also suitable for the side of an armchair or as a serving table. High or low mode with round top in melamine and black painted metal legs. Set of two industrial style coffee tables in stoneware and metal or wood and metal. Two pieces to use together or independently, with rectangular top in melamine or marble effect. New Line Double pair of modern living room end tables with top available in 5 finishes. The "nesting doll" effect offers a space-saving opportunity when the end tables are not used. 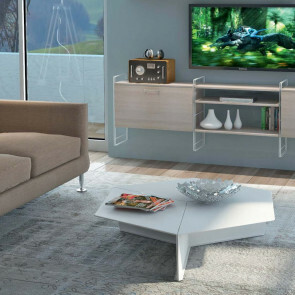 New Line is a square-shaped coffee table with two wooden shelves, also available in a rectangular model. Minimal structure, clean and simple lines, ideal for the living room in front of the sofa. 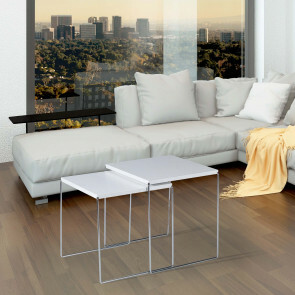 Quasar living room rectangular coffee table with two wooden shelves and structure in chromed metal. 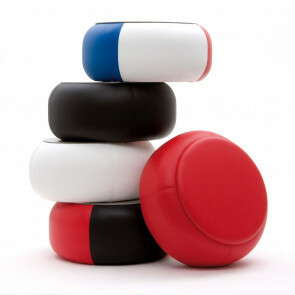 A furniture accessory ideal for the living room, in order to make the area near the sofa more functional. Esagono matt lacquered living room coffee table is cm 34 in height and it is ideal for the living room in front of the sofa. Esagonal shape, available in 3 modern colours. Box is a square coffee table for the sitting room with storage and big drawer. The top is made of wood and clear glass. The single drawer can be pulled out from both sides. 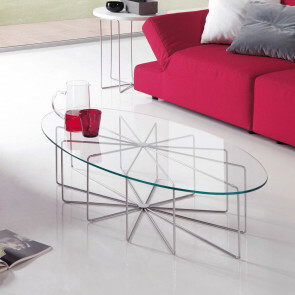 Tetris is a low triangular coffee table for the sitting room, suitable also as an end table. 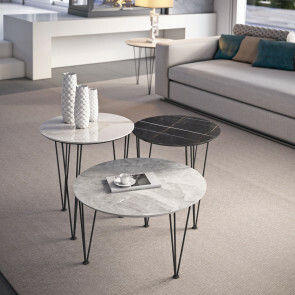 By matching more coffee tables you can create customized compositions. Silver Glass coffee table for the sitting room, in an oval and round model. Thanks to the height of cm 26 it is suitable inside the sitting room in front of the sofa as an extra surface for several objects. 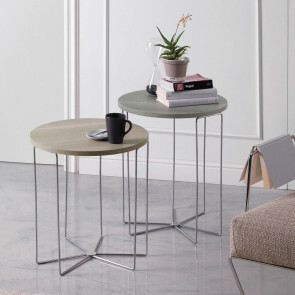 Silver Wood round end table for the sitting room is characterized by the combination of two different materials: wood for the top, metal tubes for the structure. It is available in two heights. Co-Ala is an adjustable and coffee table convertible in dining table. The top doubles thus allowing to accommodate 4 guests. Available with top in several wood finishes or in white. 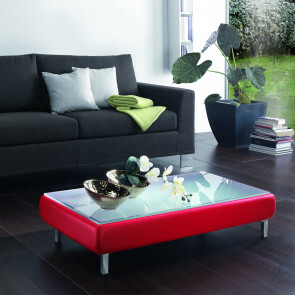 Magico coloured ottoman coffee table is realized in eco-leather in several colours. It is equipped with a lifting top which allows to store the objects inside the versatile compartment. Soft storage coffee table has a lifting top, which is useful to easily store the objects inside the internal compartment. The side structure is covered in eco-leather, available in several colours. Cambridge glass coffee table with magazine rack is perfect to keep your living room tidy. 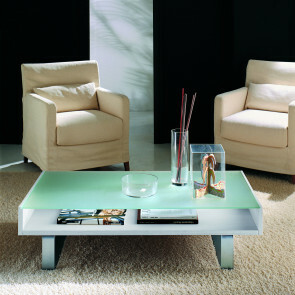 The frosted glass top adds elegance to this modern occasional table. 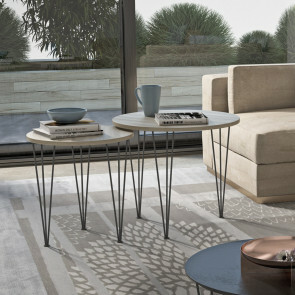 Petalo is a coffee table for the sitting room with a rotating top which conceals a compartment. Ideal for a front sofa placement, an useful surface and a compartment for magazines, books and objects. 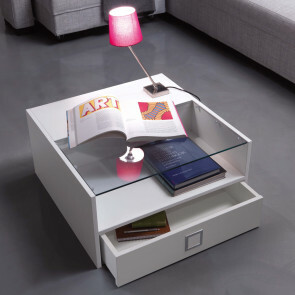 London coffee table for the sitting room with drawer is an elegant accessory to use for the storage several objects. It is realized by combining three different materials. 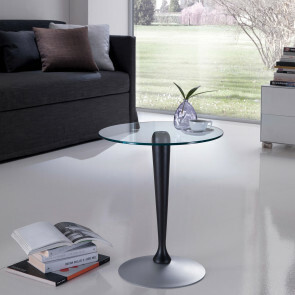 Maggiordomo is an end table with clear glass top with a round shape. A service coffee table for the sitting room or the bedroom, which can be used also as a nightstand.